Capture fast resistance changes in a graph. 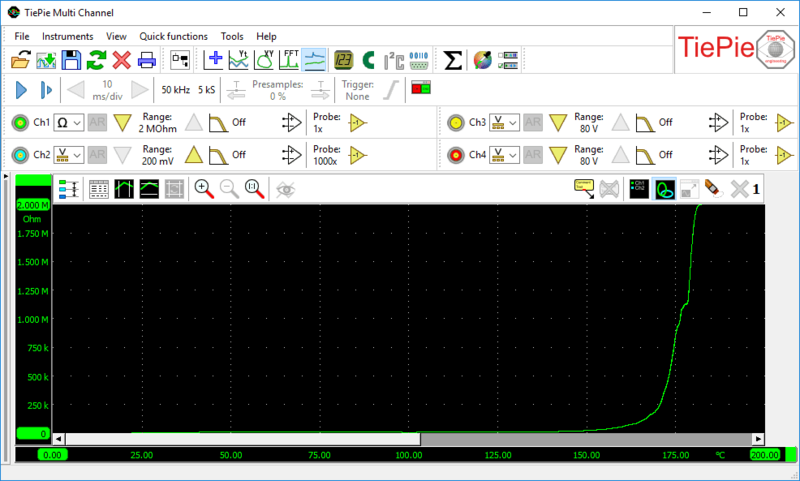 Detect and locate carbon track defects in a variable resistor. Create resistance graphs of special resistors like NTCs and PTCs. Use e.g. channel 1 to measure the resistance of the PTC and channel 2 to measure the temperature. An XY plot will then show the resistance variation as a function of the temperature. Figure 1: Measuring a PTC characteristic with the Ohm scope in XY mode. The Ohm scope uses the same inputs as the oscilloscope. Changing the measure leads is not required. The advanced protection against over voltage ensures that the Ohm scope withstands high voltages. SureConnect is available as an option on the Handyscope HS6 DIFF and Handyscope HS5.